In classical music, how you develop material is more important than its source. Simply put, “variations” always trump “themes.” Example: any of Elgar’s elaborately constructed Enigma Variations, as opposed to the original staid tune that gave birth to them. Similarly, in jazz, any improvisation is more interesting than the head, or melody. 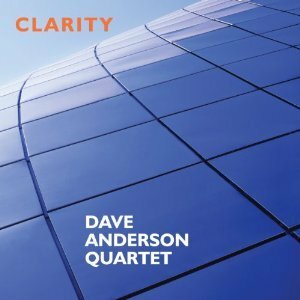 Which segues to this debut album by composer/saxophonist Dave Anderson: a master class in giving eight originals (two other tracks are by Dizzy Gillespie and Joe Henderson), their fragments of scales or entire lines, complete make-overs harmonically, rhythmically and melodically. That’s how jazz-oriented writers develop their material. If you’re lucky enough to visit Seattle and hear the Anderson foursome live, don’t expect to hear the exact sounds contained herein. It’s just not in the DNA of thinking jazzmen to duplicate licks, riffs or over-all moods. Anderson was lucky enough to gravitate from his native Minnesota to Seattle, where he fell in with the right crowd (all heard here): pianist John Hansen, with whom he studied piano briefly; bassist Chuck Kistler; drummer Adam Kessler; and trumpeter Thomas Marriott, guest-fluging on one track. They all share a passion for unexpected melodic detours, highly extended chords and complex rhythms. In other words, take something basic, develop it into a modern, challenging chart and provide accessibility and — yes, “clarity” — to the un-hip. Mission accomplished. Each track achieves that goal, including Anderson’s doublings on alto sax. Listen to the ease with which “Stablemate” juxtaposes a feeling of 4/4 and 3/4, or am I deluding myself? Could it simply be four against three? “Troubled Angel” contains drummer Kessler’s most impressive statements. “The Aviator” sounds like it’s based on mid-Eastern scales: an intriguing duo between soprano sax and piano. Henderson’s “Y Ya La Quiero” literally floats on the Latin jazz phrasing of Hansen’s piano and Anderson’s soprano plus the bossa bounce of bassist Kistler and Kessler’s non-stop muscularity. The Gillespie melody, “Beautiful Love,” often heard as a waltz or ballad, is enhanced by a subtle Latin pulse, but above all, by Anderson’s soprano. As for the bonus, “Wabi-Sabi,” Anderson and Marriott form a pleasantly swinging front line. The timbres of soprano and flugelhorn — like the ideas and the phrasing of the two soloists — are remarkably compatible. Hopefully they will record together in the future.